Our Products: Karting Dirt Track Drag Racing Snowmobiling Not A Racer? For over two decades Advanced Design Leathers has been the number one choice for quality leather racing jackets. Weather your doing championship jackets for track/ series or giving away a jacket for a race Advanced Design has the solution for you. Since Advanced Design began in the 1990’s we have done well over 15,000 jackets & racing suits to fit your every need. In the past few years AD Leathers has become the #1 championship jacket supplier in the United States. Providing championship jackets for some of the largest karting series including the Maxxis MAXX DADDY’S, Maxxis South Eastern Dirt Series, DynoCams Tri-State Pro Series, Burris Thunder Series, New York Dirt Track Series and many more. Get Jackets for your Club/Series/Track Today!!! Get started today by click here and setting up your order for your jackets today by using our new and simple to use ordering system. 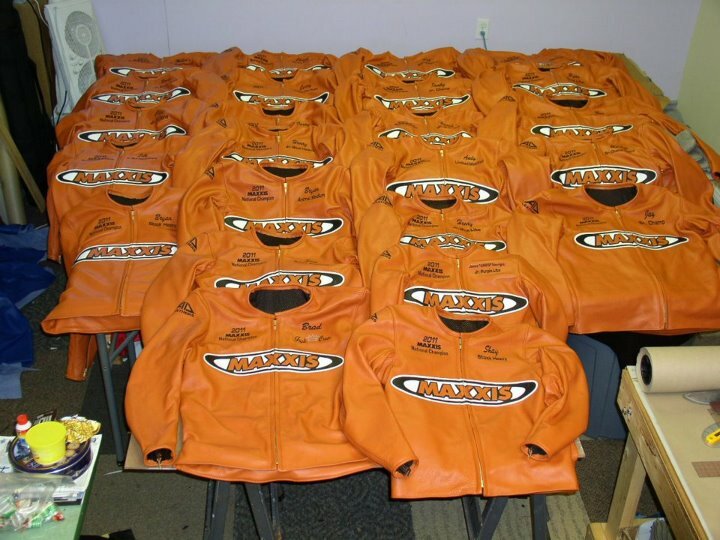 Jackets from a series are designed by the race director/promoter. Whatever color or graphics package is decided on is what the jackets will look like. If a driver wants a nickname on the back, THEY MUST TELL YOU before you submit your paperwork. Any deviation from the club layout MUST BE APPROVED by YOU at the time the club order is placed.